“Originally a home for retired sailors, this beautiful campus of landmark Greek Revival architecture and lush parkland was purchased by the city in 1973 and converted into an arts center which meets the cultural needs of its community. Over the years, the buildings have undergone renovation and various cultural institutions, including The Staten Island Botanical Garden, The Staten Island Children’s Museum, and The John A. Noble Collection have moved in. Robert Richard Randall founded Sailors’ Snug Harbor as a “haven for aged, decrepit and worn out sailors” with his benefactors’ bequest of 1801. Over the next century, Sailors’ Snug Harbor expanded from its original three buildings to 50 structures and 900 residents from every corner of the world. By the turn of the 20th century, Sailors’ Snug Harbor was the richest charitable institution in the United States and a self-sustaining community composed of a working farm, dairy, bakery, chapel, sanatorium, hospital, music hall and cemetery. Snug Harbor’s major buildings are representative of the changing architectural styles of the early 19th and 20th centuries. The first buildings were built in the Greek Revival style. As the complex expanded, new buildings were erected in the Beaux Arts, Renaissance Revival, Second Empire and Italianate styles. High Victorian decorative components were added throughout the 83-acre site. Sailors’ Snug Harbor’s experienced financial difficulties in the mid-20th century as the number of residents dwindled and financial pressures multiplied. The population of the celebrated retirement home and hospital began to decline when federal programs such as Social Security and Medicare were introduced. Sailors’ Snug Harbor had been the first welfare institution sailors could turn to for help, but after a century of service, retirees had more options. After World War II financial resources were focused on the individual care of the aging population, not facilities. The historic buildings of Sailors’ Snug Harbor began to deteriorate. The hospital, sanatorium, farm buildings and several service buildings were demolished in 1951.The white marble Randall Memorial Church, fell into disrepair and by 1952 was also demolished. The community was outraged by the loss of the structure. Fortunately in the 1960s, the newly formed New York City Landmarks Commission stepped forward to save the five Greek Revival front buildings and the chapel and designated them New York City’s first landmark structures. They were also listed on the National Register of Historic Places. Local activists and artists worked during the 1970s with elected officials to secure the unique property and its principal buildings for the City of New York with the objective to transform the complex into a regional arts center. The newly formed Snug Harbor Cultural Center was incorporated in 1975. 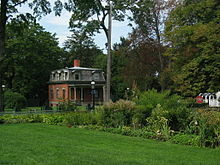 In 2008, Snug Harbor Cultural Center combined with the Staten Island Botanical Gardens to become Snug Harbor Cultural Center & Botanical Garden. Today, Snug Harbor is a place where history, architecture, visual art, theater, dance, music and environmental science come together and provide dynamic experiences for all ages. It is one of the largest ongoing adaptive reuse projects in America, consisting of 28 buildings, and is one of New York City’s unique architectural complexes and historic landscapes. Majestic buildings of classic architectural styles present exhibitions on historical subjects and contemporary art. Its Music Hall is the one of the oldest concert halls in New York City, second only to Carnegie Hall, and serves as the centerpiece for performing arts. Nine distinctive botanical gardens are spread across the site and include the celebrated New York Chinese Scholar’s Garden and the newly completed Richmond County Savings Foundation Tuscan Garden, based on the 18th Century garden at the Villa Gamberaia in Florence, Italy. Snug Harbor is also home to Art Lab, the Staten Island Arts, the Newhouse Center for Contemporary Art, the Noble Maritime Collection, Snug Harbor Artist Residency Program (SHARP), Staten Island Children’s Museum and the Staten Island Museum. Snug Harbor is a proud Smithsonian affiliate. From the Goethals Bridge: Take 278 East or take the Outerbridge Crossing to 440 North, following signs to the Verrazano Bridge/278 East. Get off 278 East at the exit marked Richmond Road/Clove Road. (Do not take the Richmond Avenue exit). Take the service road to the first light, make a left, and follow Clove Road to Richmond Terrace. Make a right on Richmond Terrace and follow it until you come to Snug Harbor, which is on the right and marked by a black cast iron fence and magnificent pillared buildings at Snug Harbor Road. Turn right and you will see the entrance gate on your left-hand side. Follow the signs for parking. From the Bayonne Bridge: take the first exit (Richmond Terrace). Make a right at the top of the exit ramp onto Richmond Terrace. The Terrace snakes around a bit, following the shore of the Kill Van Kull river. Go about 3 – 4 miles, you will see Snug Harbor on the Right. It is just past the Getty gas station and a little restaurant on the left called Blue that opens soon. Take the lower level of Verrazano Narrows Bridge; stay on the right, and exit at Bay Street. Take the Bay Street exit service road to Bay Street. Make a left and follow Bay Street past the Staten Island Ferry Terminal, where Bay Street becomes Richmond Terrace. Follow Richmond Terrace about one mile to Tysen Street. Make a left on Tysen Street, and then the next right on Fillmore Street, and enter the parking lot immediately to the left of the gated entrance. Parking will be right after the gate on the left-hand side. Brooklyn Battery Tunnel to BQE West. Verrazano-Narrows Bridge to SI Expwy (I-278). Get off at Clove/Richmond Road exit (#13). At third intersection, bear right onto Clove Road. Continue to Bement Ave. (will see a cemetery), turn right onto Bement. Continue to Richmond Terrace. Make a right onto Richmond Terrace to Snug Harbor. Make a quick right at the Snug Harbor sign and then a quick left through the brick gatehouse.